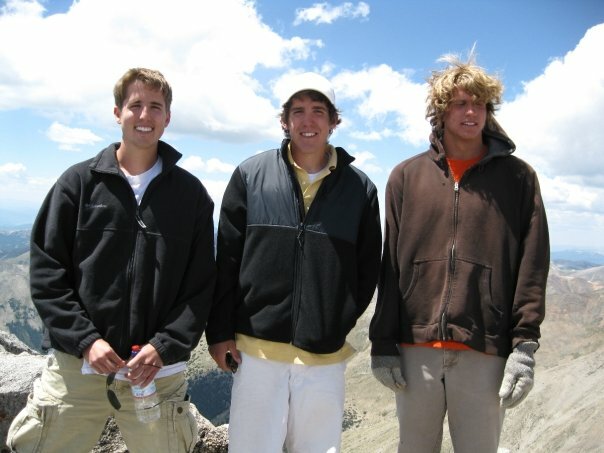 Rewind back to 2009… I was living just outside of Salida in a town called Poncha Springs and working golf course construction as a summer job. Poncha Springs and Salida sit in the Arkansas Valley which is surrounded by the Sangre De Cristo and Sawatch mountain ranges. 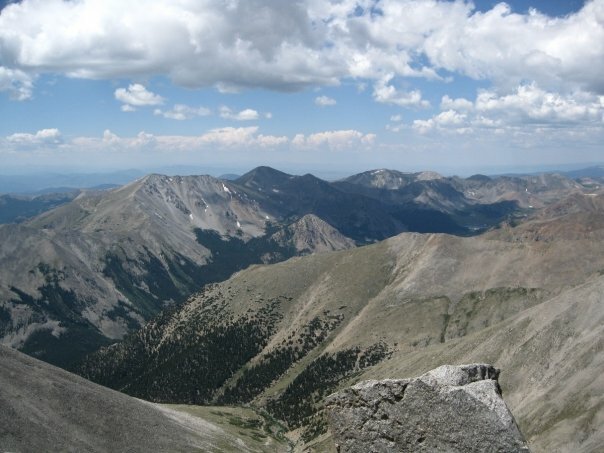 The Sawatch range is home to more 14ers than any other range in Colorad0, So, basically Salida is an ideal place to call home. 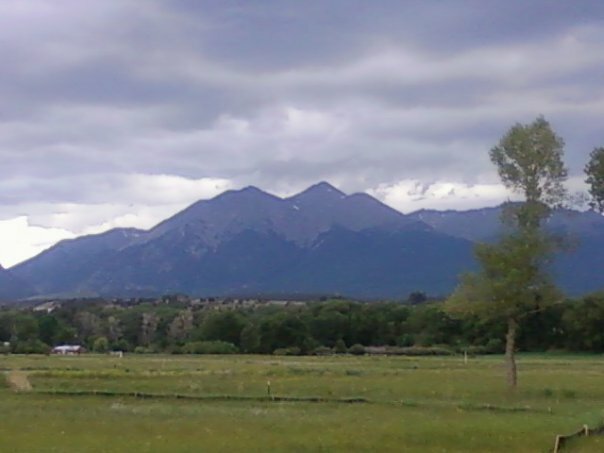 There are two 14ers that are within a 20 minute drive from downtown Salida (can’t get much closer than that). Tanner (my cousin) and I got tired of looking at these two 14ers staring us in the face every day at work and decided to do something about it. We were extreme newbies at the whole climbing mountains thing but put in our due diligence and researched the route and weather conditions. We felt pretty confident going in, not really knowing what we were getting ourselves into. For anyone that’s never climbed/hiked a mountain, it’s pretty grueling/exhausting/mentally draining stuff, but totally worth the effort regardless of whether you summit or not. Mt. Shavano standing tall above the Arkansas Valley. So, Mt. Shavano it was. 8:30am start time, which may have been later (this was 6 years ago and the details are a little fuzzy). We drove my 2 wheel drive Grand Am up CR 250 which later turns into FR 252, a bumpy, slightly rough dirt road to the trailhead, which also connects with the Colorado trail and has some really great campsites. This trail is extremely well maintained for the first 1/2 mile or so. You come to a couple junctions, one being the Colorado trail, but the trails are well marked and easy to follow. Eventually the trail turns into an old, dried up creek bed and after stumbling over rocks and tree roots you begin to curse the damn thing. This past summer a buddy and I decided it would be a good idea to hike our snowboards and skis up to the summit in June (turned out to be a great idea!) and catch some turns on the Angel of Shavano (trip report coming soon). Being extreme newbies at this, we ended up losing the trail several times and at one point started hiking off trail straight up the face of the east ridge (horrible idea), eventually crossing paths with the trail again. The views were a little underwhelming as we were below tree line for quite sometime. After a few miles of trekking, the trail bends around the east ridge and you’re able to catch a glimpse of the Arkansas Valley. 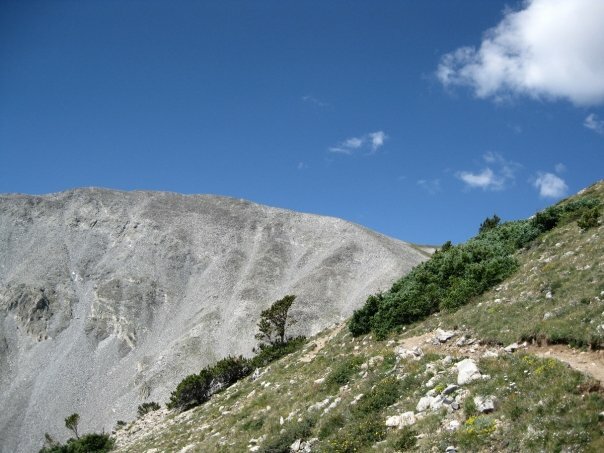 The trail heads back to the west as you cross a few boulder and scree fields. 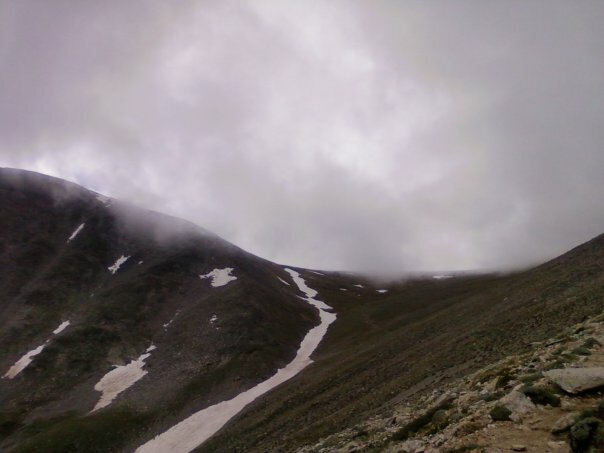 The Angle of Shavano (a snow formation resembling an angel) holds snow well into July and if it’s been a good winter it will hold snow thru August. This forces you to cross a couple sections of steep snow which can be a little tricky and unnerving at times. At this point the trail begins to steepen and from here on out is a test of mental and physical endurance. The last 500 vertical feet or so is class 2 scrambling up large blocks of rock which in late June were still covered in snow. This portion of the hike is where the mental endurance comes into play. At this point you are tired, sore, and probably hungry. You can see the summit but it never really seems to get any closer. This stretch seems to go on forever. Many times throughout hikes I find that I have to focus on just putting one foot in front of the other while focusing on my breathing. It helps take my mind off the soreness my body is experiencing and how badly I would love to be sitting on my couch. This section is definitely one of those times. hiking newbies at their finest! After struggling for what seemed like hours (which it was) we finally topped out on the summit. It was such a great feeling knowing that all the suffering we had endured for the past 3+ hours had finally payed off and we had accomplished what we had set out to do. While sitting at the summit and taking in the views and cold, fresh air I realized that this was where I was suppose to be. I felt at home struggling and fighting and pushing my body to the limit, all in the name of gaining the summit. It all felt so natural. I’ve now realized that summitting is only a small portion of why I climb. The pure joy of being immersed in nature, unplugged from the rest of the world is what it’s all about. Just plain and simple living. This mountain will always hold a special place in my heart. I honestly feel that it set in motion decisions that put me on a path which eventually brought me back to Colorado and into the life that I live today.